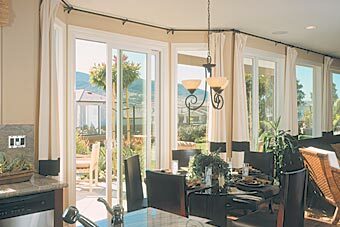 You'll love the view from your Milgard Style Line® patio door. It combines sleek modern lines with maximum glass for a large viewing area. Style Line sliding doors feature the same quality vinyl compounds and distinctive hardware that have made Milgard the preferred choice for new and existing homes. Milgard's maintenance-free vinyl frames won't crack, peel or require paint. What's more, all our vinyl sliding glass doors include a steel reinforcement beam and locksets which exceeds the nation's toughest forced-entry codes. Click on the door to begin pricing and ordering. A slimmer frame design for a more contemporary look.